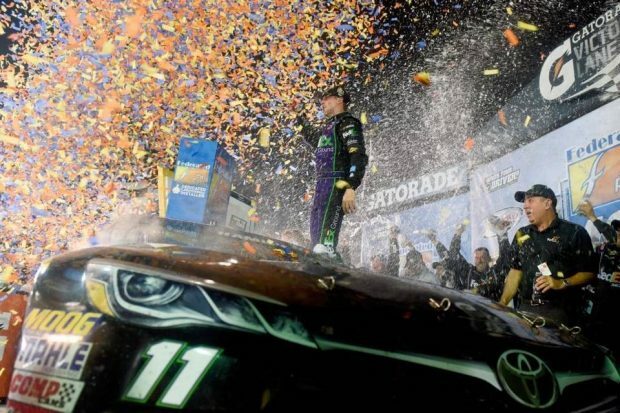 Home > US Sports > Nascar > Denny Hamlin wins a wild one at his home track. Denny Hamlin won Saturday’s Federated Auto Parts 400 at Richmond International Raceway as the drama of who would make up NASCAR’s Chase field occured behind him.Hamlin’s victory in a green-white-checker finish was his third of the season, managing to outrace a hard-charging Kyle Larson on the 405th of a scheduled 400 laps. Hamlin was one of 12 drivers who had already clinched a spot in the 16-driver, 10-race Chase, which begins next Sunday at Chicagoland Speedway. Rookie Chris Buescher, who needed to maintain his spot in the top 30 in points to make the Chase, did that by finishing 24th. Jamie McMurray grabbed the 16th and final spot with a sixth-place finish. “That’s what’s so special about it. … I see all the extra Denny Hamlin shrts and hats everything and it fires me up every time I get here,” Hamlin said.Truex finished third, followed by Brad Keselowski and Kevin Harvick rounding out the top 5. Newman and Stewart were involved in a wreck. Newman entered the race 22 points outside the final playoff spot and needing a win to secure a spot in the Chase. His fight was made even more difficult after NASCAR nailed him with a 15-point penalty on Wednesday because his car failed post-race inspection last week at Darlington. During the Richmond race, the final race of the regular season, Stewart and Newman made contact in turn 1, and Stewart then retaliated, wrecking Newman. David Ragan and Brian Scott were also involved.The crash pretty much sealed the deal that Newman wouldn’t be in the chase. Following the crash, Newman went off on his former boss. 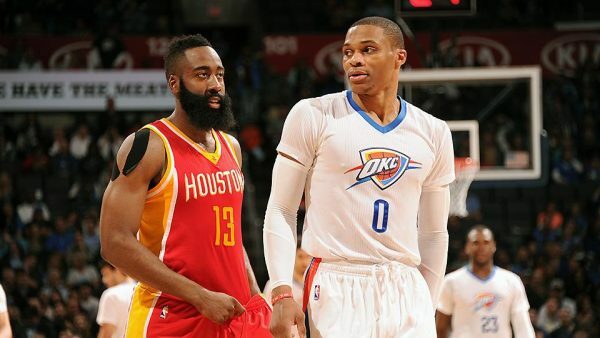 Harden Leading MVP Race After Win @ Thunder?